Our ground floor, Island style condo is steps away from the pool, Jacuzzi and BBQ area. This unit is 2 bedroom, 2 bath. The bedrooms have comfortable Queen size beds. The condo has been completely updated and includes new full size washer and dryer. There even is small extra refrigerator just for keeping your beverages cold. Pacific Shores is a small condo complex with well maintained grounds. Our maintenance crew here take pride in their work and it shows. The pool area is meticulously cleaned and the grounds are well manicured. Our Pacific Shores complex is a short walk (less then 5 mins) to Charley Young Beach and Kamaole Beach I. The beautiful white sandy beach across from the property is popular for swimming, bodyboarding, standup paddle boarding, kayaking and just relaxing. A short distance away is a popular place called The Cove where people go to surf and to Paddleboard surf. You can even rent and/or take a lesson. For a really great experience try The Big Kahuna surf shop. They will even take video of you surfing. Family owned business' great people. My husband and I started coming to Maui about 10 years ago. As time went on we found that we were extending our vacation by an extra week each year. We love Maui and find that there is always something new for us to discover. Our dream was to have a place here in Maui. 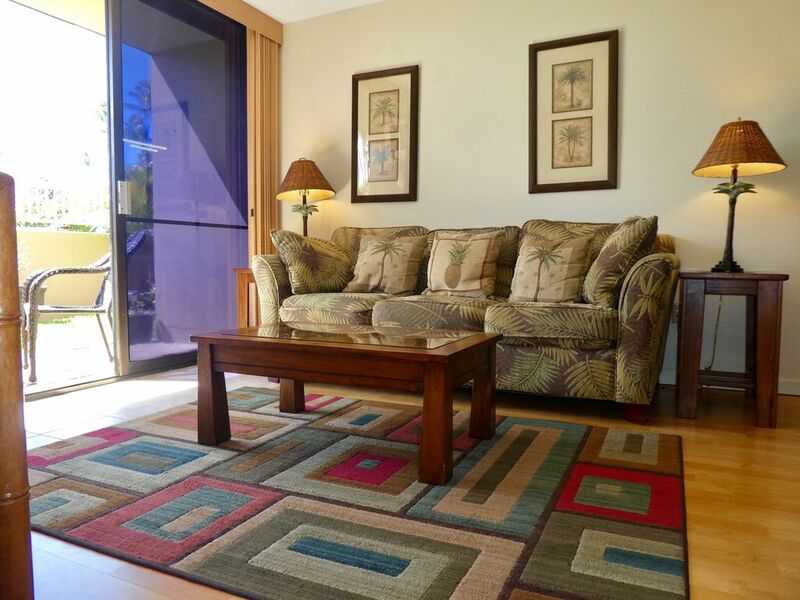 In 2013 we purchased our unit here at Pacific Shores and have taken a year furnishing,decorating and updating ( wait to you see the new shower) making our condo into a comfy and cozy tropical getaway. We hope that you will truly enjoy it as much as we do. Great place to stay! Perfect location!! Condo was in perfect location right across the street from ocean! Julie was great to work with if we had questions! Condo was clean, beds were comfortable, size of condo was good size for four people! Will definitely go back and stay there again! This condo had everything we could possibly need to enjoy our stay. Kitchen was nicely equipped. All the beach toys/life jackets/boogie boards/beach chairs and towels were very much appreciated. The condo was very clean and quiet. Especially loved the location to the warm pool/bbq (10 steps) and the very lovely Kamaole I beach (5 minutes walk). Parking is very close to the unit. This was our 3rd visit to Maui and we would most definitely stay here again. It is apparent that the owners take great pride in this unit. Thanks Julie for having us! Thank you for taking time to review our condo and for your wonderful review. It truly makes me happy to hear that your family really enjoyed our place. I thank you for taking such great care of the condo. You and your family where great guests and we would welcome you back anytime. The condo located in a very convenient area. It looks like a very newly built or updated inside. We lived there two nights only. Very impressed with the communication with the owner, Julie provides a lot of stuff for outside activities, you don’t need bring your own beach towels, lunges, beach umbrella, snorkels, swimming flippers. There are also a lot of playing toyes for kids, including life vest, kids snorkels, beach bucket, shovel, etc. The two bedrooms are very clean, two bathrooms (one is shower, the other one has a jacuzzi tub) are decorated very nice. I like the kitchen, with granite countertops and maple cupboards. Everything is clean for use, the dishwasher and refrigerator looks not so old, space is enough. What made us surprised is the sofa in the living room, it is a full bed when pulling it out. We have 5 people, one person lived in the sleeper sofa, so this condo is actually can sleep 6 people. We love it and absolutely will come back next time. Thank you Julie Williams! Julie’s place was the perfect spot for our family vacation, easy access to Charlie young beach, close to shopping and the playground. Our kids loved being right beside the pool. The condo is clean and well appointed with decent kitchen ware you can actually cook with, we loved that there reusable to go containers. Julie was very friendly and easy to communicate with. I hope we can stay there next time we go to Maui! It was wonderful having you and your family stay in our condo. Thank you for being so great. You guys are welcome back anytime. You do not really need a car when staying here. And it is roomy with a kitchen that has what is needed to cook. We would stay here again.